To get a sense of why stretching will work to reduce your pf symptoms, let’s first take a tiny step backwards to get a solid grasp of the mechanics behind your heel pain. The fibrous ligament known as the plantar facia is essentially strung from the base of your heel and then spreads out connecting to the ball of your foot. The plantar fascia is thick, has a little stretch to it, and acts as a kind of shock absorber. Ok so you probably already knew that, but here’s where the mechanics get interesting. As you place weight on your foot with each step, the arch of your foot flattens slightly. As the arch is flattened, it stretches your plantar fascia. Ouch! If you do anything that causes the chronic flattening of the arch, the plant fascia is going to be put into tension more often, making it tough to repair the tiny tears that occur with each stretching. Like a rubber band that has the pulled past its limit, these tiny tears become larger overtime manifesting as full-blown heel pain. **Below, you’ll find our stretching routines, but you can also click the links above to see current prices or read customer reviews on Amazon. So why specifically heel pain? Well, the majority of the tears occur where the plantar fascia attaches to the heel bone. Your heel hurts because that’s where the most severe tears have occurred. Bringing it all together, this is why supporting the arch is so important when focusing on your recovery. Cushion is great for absorbing some of the shock, but the real issue at hand is that your arch is flattening out excessively. If you can support the arch, then the plantar fascia doesn’t need to do as much work and begin to repair the tears. You can support the arch with a combination of strengthening, stretching, shoes, inserts and a whole host of other options, but we’re getting ahead of ourselves here. Back to the issue of flattening the arch. This is also known by another term you might already familiar with, pronation! And when the arch is heightened, this is called supination. Technical terminology aside, all you need to know is that your plantar fasciia is busy attempting to heal when you are off your feet. When you take your first steps in the morning or after a long rest, the pain returns immediately, an indication of re-tearing. Then the pain subsides after a few steps. Thus morning pain. Wait, so how again do plantar fasciitis stretches help with all of this? Everyone can probably hum the song, “the knee bone is connected to the leg bone, the leg bone is connected to the…” and so forth. With respect to your legs and feet, the calf muscle is connected to your Achilles tendon, at the rear of your foot. The Achilles tendon is connected to your ankle (subtalar joint specifically). Tightness of the calf will thereby tighten your Achilles, limit the movement of your ankle causing it to stretch your plantar fasciitis. Wow, right? Who knew something as remote as the calf muscle could be a culprit in heel pain. Bringing it all together once more, failing to properly stretch your calf muscle during exercise will stretch your plantar fascia. And to further connect the dots, if you wear shoes with high heels frequently you will be unknowingly tightening your calf muscles. We won’t get into the mechanics on why that is the case, since we’ve already introduced a lot of new material here…just trust us on this one. Ditch the high heels, heeled boots, whatever at least while your plantar fascia is made whole again. When you first get up, you want to avoid the pain that comes with tearing the new tissue that formed while you were resting. Make your way as gingerly as possible to the nearest wall. I would recommend keeping a pair of shoes with solid arch support right below your bed, so that you don’t risk abruptly stretching your plantar fascia. Now you are facing the wall and your arches are well supported (you are not in your bare feet). Repeat these stretches after taking any long rest during the day, approximately 3-5 times. Loosen up your calf muscles from the comfort of your very own bed. You might not want to risk take any steps, even if it is to reach the nearest wall, without first stretching your calf muscle. Stretch before those first morning steps and all you will need to do this is a towel. Alternatively, you can find some great devices online to help out with your stretching. Whether they actually work better than using a wall or a towel is up for you to decide. The North American Healthcare Foot Rocker works like the stretching routine #1, listed above. In rocking back and forth you can loosen up your upper and lower calf muscles, thus reducing tension on your arch. Roller balls, are another popular tool, although this strategy has more to do with massaging than stretching. In targeting the knotted areas, you can begin to break down some of the accumulated scar tissue. For added pain relief you can put your massage ball in the freezer before use. Pro tip, although massage balls tend to run between $5 – $15 you can just fill up a plastic water bottle and place it in the freezer over night. Or if you aren’t germaphobic, you could use a rolling pin… however I would leave your socks on and of course give it a good rinse before making that next batch of cookies. 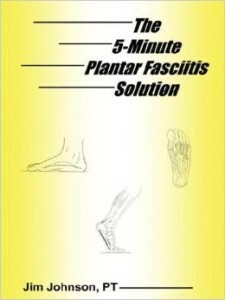 In case the above prelude to stretching has whetted your appetite for plantar fasciitis knowledge, check out The Five-minute Plantar Fasciitis Solution. It’s a quick and easy guide to a do it yourself program.Written by Jim Johnson – a board certified physical therapist for over 23 years – this book can be read in 2-3 hours. And at the end those 86 pages you should have a much more complete understanding of your condition of course some of the stretching routines mentioned in this article. So if you’re feeling like you need just a little more information before moving forward with stretches or any of the other often recommended treatment options, then this simple guide could be the perfect investment. You can pick up a new paperback copy for around $25 or a used copy for $16.